Fan of the Fast Furniture Fad? With the fashion for fast furniture, is there still demand for quality? Fast furniture fad? ‘What the f-f-f-flip is that?’ you might say. You’ve probably heard of ‘fast fashion’ – cut-price clothing that you buy cheap, wear for a season and discard. Well ‘fast furniture’ is the same principle; low-cost furniture that you use for a couple of years and then replace. 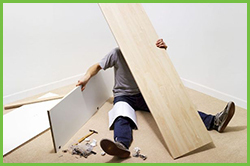 You know what you’re getting with fast furniture: usually flat pack, standard sizes, basic materials and simple construction (necessarily so due to the build-at-home nature of them). It’s not really meant to last long; the planned obsolescence isn’t disguised in any way either in terms of quality or trend, but it’s good enough for a fixed period. For many this type of ‘disposable’ furniture is fine – it’s great for people who like to change their décor regularly, those in short term rented accommodation or those with young children or pets where furniture tends to get damaged easily, but it’s not for everyone. For many, the furniture that they buy must be good quality and it must last a long time. A fitted bedroom is the polar opposite of this; more ‘slow style’ than fast furniture! It obviously costs more and it’s very permanent; most people expect a fitted suite to be in place for at least 10 years, if not longer. So, which is the better option? Clearly that’s a personal judgement. If you like lots of change and paying out little but often then fast fashion is your ‘jam’ but if quality and timeless design is more your thing then ‘slow style’ could be the right choice for you. It is more expense up front but you know the old adage, ‘buy cheap, buy twice’ and add up the cost of replacing furniture every few years and you might find that costs are actually quite comparable. You’re also paying for craftsmanship with fitted furniture; constructed by a professional fitter who is not afraid of a dovetail joint or complex structure! Plus, you’ll be using all of your available nooks and crannies to achieve maximum usage which isn’t always the case when you’re buying standard sized furniture. But what about trends? The fitted furniture might last a long time but what about the style? It’s a good point, after all pine and black ash were all the rage a few years ago but who wants that now? Fitted bedroom designers and manufacturers have considered this and aimed to make their fitted furniture designs as classic and timeless as possible – avoiding quick-to-date styles and materials and sticking with classic, understated schemes - plus there are still options to make some changes over the years with accessories and details, without too much disruption or expense. You can even change the doors and fronts if you really want to ring the changes after a few years. Whether your preference is for fast furniture or slow style, or something in between, it has to work for your lifestyle, budget and space. If the idea of long term quality appeals to you, and you want to explore the idea of fitted bedroom furniture further, we’d be more than happy to create some designs and give you a quote. You could start with our bedroom planning guide or request a design consultation here. If fast furniture is more your thing we recommend a good screwdriver and some knee pads! 1 Response to "Fan of the Fast Furniture Fad?"